On behalf of the NAGIA Board of Directors, I would like to thank you for your interest in becoming a member association of the only alliance of gang professionals in the world. To accomplish that goal, NAGIA welcomes state and regional associations to apply for membership. Individual gang investigators represented through these regional and state associations are considered members of NAGIA upon acceptance of the applicant association. For individuals interested in Gang Investigator Association membership, please contact your local, state or regional association. NAGIA does not support individual membership. 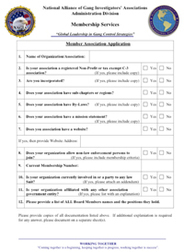 Associations interested in joining, below you will find a Member Association application form, which is designed to give the NAGIA Board of Directors a brief outline of your association. The process for application is also outlined within the Member Association Application. If you have any questions regarding this process, please do not hesitate to contact me directly at 530-621-6030. We thank you for your interest in NAGIA and look forward to meeting with you. Download the Application Form, Print, Clearly fill in all fields, and Mail to address below.